I have loved this stamp from the first time I saw this hostess stamp set in the Stampin' Up! catalog. It has been calling my name to use it since, but I was looking for the right sketch to try it out on. Sketch 137 at Card Positioning Systems provided the perfect opportunity to put some ink on that stamp especially with winter right around the corner. I also used ruffles on the ribbon for the Moxie Fab Challenge. I have never participated in the challenges over there, but I love ribbon and ruffles, so I had to play. 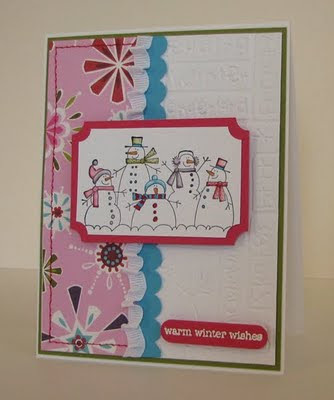 Cardstock, stamps, ribbon, ink, markers, ticket corner punch, word window punch, embossing powder: Stampin' Up! Ooh, great colors! I love what you did with this one. Amy, this is a sweet, pretty card! You could edit your post and add it as another entry to the Caardvarks' Take A Bow challenge...it ends tonight! thanks for your comment sweetie! Absolutely love hjow you ruffled that ribbon!! and that stamp IS adorable! I love the colors you added to the snowman. Great job!! !